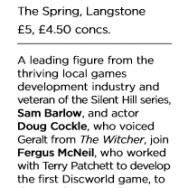 I recently attended the Havant Literary Festival as a panel member for the Games and Story discussion with Sam Barlow (Silent Hill series) and Fergus McNeil (Author and developer of some of Terry Pratchett’s games). A great discussion and met some lovely people. Very fun to be part of it!